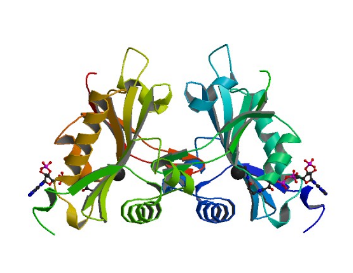 The Human Naa60 is a N-terminal acetyltransferase .It is only found in multicellular eukaryotes and mainly catalyzes the N-terminal acetylation of transmembrane proteins. It is located on the Golgi apparatus through its C-terminal membrane region. It plays a role in maintaining the integrity of the Golgi apparatus, as knockdown results in fragmentation of the organelle. It also has lysine NE acetyltransferase (KAT) activity, which allows it to facilitate acetylation of free histone H4. Thus, Naa60 also plays a role in nucleosome assembly. Knockdown of this protein inhibits cell proliferation and induces apoptosis. Naa60 is an enzyme containing a Gcn5-related N-acetyltransferase (GNAT) fold. The monomer is made up of nine beta strands and nine alpha helixes, resembling the structure of other N-acetyltransferases. Naa60 differs from these other NATs with a 20 residue loop that forms a small subdomain that is critical for protein stabilization. Sequence divergence also occurs at the which is linked to protein dimerization. However, the enzyme is only active in it monomeric state and dimerization contributes to inactivation. The beta seven and beta eight strands of Naa60 are also significantly different from the structure of other NATs, with an antiparallel beta-hairpin structure. The helical structures formed by the N and C-terminals reach out from the central GCN5 domain. The is amphiphatic, and contacts a neighbor molecule through hydrophobic interactions between the alpha five helix and a hydrophobic groove between the N-terminal beta-1 and beta-3 strands of the neighboring molecule. A malonate molecule is located in the active site and may be indicative of the substrate binding position of Naa60. Residues Tyr 38, Asn 143, Tyr 165 interact with the malonate through hydrogen bonds or water bridges . The active site of Naa60 includes residues Glu 37, Tyr 97, and His 138 . Residues 182-216 are important for localization on the Golgi apparatus, and specifically the alpha five helix, made of residues 190 to 202 This helix is made up of hydrophobic residues Ile 190, Leu 191, Ile 194, Leu 197, and Leu 201 . Here, Naa60 is a monomeric enzyme in complex with Acetyl CoA. However, the hNaa60 specific allows the molecule to dimerize. The loop of the first protomer protrudes into the calaytic site of the second protomer in the dimer when no substrate peptide is present. Subseqeuntly, substrates are unable to bind and the enzyme becomes inactive. Several contacts mediate hNaa60/CoA dimerization, primarily those that anchor peptide substrates in the hNaa60 monomer. Van der Waals contacts connect Leu 171 of each dimer. 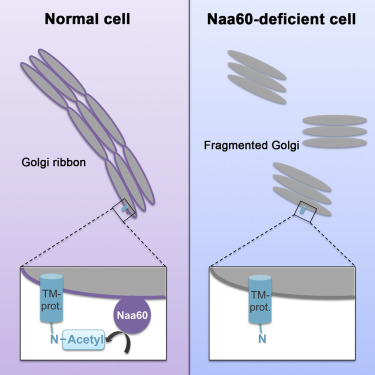 In HeLa cells, the knockdown of Naa60 results in Golgi Apparatus fragmentation, which shows the importance of the protein in the integrity of this organelle. Comparison of hNaa60 to Naa50 suggests that the sequential differences in the are responsible for hNaa60's role in the functionality of the Golgi Apparatus. More specifically, the amphipathic helix accounts for the interaction between hNaa60 and the Golgi membrane due to its ability to interact with neighboring units via hydrophobic interactions. Recent studies suggest that is crucial to the proper positioning of Acetyl CoA transfer and facilitates catalytic activity. The malonate molecule indicates a substrate binding site of hNaa60, where Trp 33 , Tyr 38 , Leu 140 , Asn 143, Tyr 165 form a substrate binding pocket. With respect to catalysis, a well-ordered water was found between in hNaa60. Chen et al. mutated these residues to alanine and phenylalanine to confirm the role of theese residues in catalysis. When these residues were mutated, catalytic activity of the protein was abolished. Aksnes, Henriette, Van Damme, Petra, Gev. 2014. An Organelle Na-Acetyltransferase, Naa60, Acetylates Cytosolic N Terminal of Transmembrane Proteins and Maintains Golgi Integrity. Cell Reports10: 1362 - 1374. Chen, Ji-Yun, Liang, Liu, Chun-Ling, Cao, Li, Mein-Jun, Tan, Kemin, Yang, Xiaohan, Yun, Cai-Hong .2016. Structure and function of human Naa60 (NatF), a Golgi-localized bi-functional acetyltransferase. Sci. Rep. 6, 31425; doi: 10.1038/srep31425(2016). Stove, Svein Isungset, Magin, Robert S., Foyn, Havard, Erik Haug, Bengt, Marmorsxtein, Ronen, Arnesen, Thomas .2016. Crystal Structure of the Golgi-Associated Human Na-acetyltransferase 60 Reveals the Molecular Determinants for the Substrate-Specific Acetylation . Cell Reports Structure 24:1044-1056.